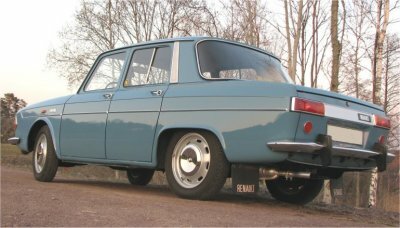 På den här webbsidan hittar du information om en av Renaults bilmodeller från 60-talet, svansmotormodellen Renault 10. Viss del av innehållet har även fokuserats på Renault 8, samt att det i begränsad mängd även finns information om de övriga svansmotormodeller som Renault tillverkade. Sidan kommer också att byggas ut med mer information om R8 framöver. Mitt huvudsyfte med den här webbsidan är att det ska finnas en sida om de här bilmodellerna på svenska, eftersom det har saknats förut. Hoppas att du hittar något av intresse! Och rösta gärna in min site på Top 50 Renaultsites (klicka på Top 50 Renaultsites-loggan ovanför)! On this website you can find information about Renault 10, one of the rear engined Renault's manufactured in the 60's. Some information is also available about Renault 8, and my intension is to complement this site with more R8 information in the future. My main purpose with this website has been to make a site about the models R8 and R10 in Swedish, since there wasn't such a site when I started to build this one. I've made some translations but the reason for me not to translate everything into English is that this should be a Swedish page in the first place. But I've tried to make it a bit easier for the foreign visitors by making a small English wordlist for those who visit my website and wants to have an English translation. It translates the link texts in the menu to the left and gives a short summary of each page the links leads to. You will find the wordlist by clicking the link "Wordlist" in the menu to the left, or just by clicking here. Another possible way to find the pages you want is to click at the link for the English sitemap in the menu, and there you will find links to all pages on this website! I hope that you will find something interesting on my website, and it would be fun if you voted for it at Top 50 Renault sites (just click on the Top 50 Renaultsites-logo above)!